After moving one blog mostly over to WordPress (2.8), I'm moving the second one as well. I'm not doing this out of the joy for WordPress (as I think Blogger has many superior features, especially when it comes to media content and blogging). However the "shell" of WP is much more user friendly, and since my only (major) complaints about WordPress are behind the scenes, I'll transition for the sake of my readers. Stay tuned for the new template. 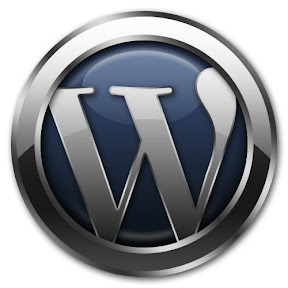 After months of debate I have decided to switch two of my blogs (IsraGood and Colony Worlds) from Blogger to WordPress. Now I'm not making this decision based on "WordPress is better than Blogger" because IMHO they both have strenghths where the other has weaknesses. Anyways both IsraGood & Colony Worlds will be down throughout the day, as I import comments, posts and attempt to maintain permalinks on the site. I will also be sporting new premium themes for each site so stay tuned!! 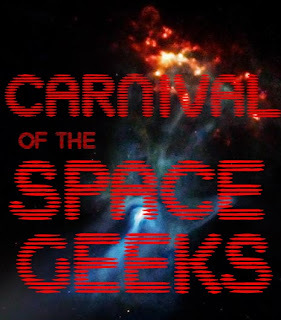 The 100th Carnival of Space (note: we've had that many already?!) was hosted by Brian Ventrudo upon One Minute Astronomer which featured many interesting articles ranging from deadly neutron stars to extraterrestrial tweeting to words of Wisdom from NASA's former leader, Mike Griffin. David Portree (from Beyond Apollo) highlights a previous plan to land a man on Mars. Ken Murphy of Out of the Cradle reviews the Orphans of Apollo film, which focuses on the private sectors attempts at making space a reality beyond governmental employees. Be sure to check out the rest of the entries on One Minute Astronomer--and without further delay here is last week's Carnival of Space which was hosted by Davide Portree on Robot Explorers. Interesting articles ranged from space diamonds to extraterrestrial ponderings to close encounters with the asteroid kind. Paul Gilster of Centauri Dreams makes a strong case for not only solar sails (which could reduce the travel time between gas giants) but for exploration as well. Stuart Atkinson from Cumbrian Sky goes in depth regarding NASA's Lunar hesitation regarding Moon bases. There were many other interesting articles (so be sure to read the rest! ), and for those of you thinking about joining in on the next round of space geek madness, be sure to check out Universe Today for more details on how to enter. Despite having the potential to feed our energy gluttonous world, lunar dust can be fetal to both humans and our robot friends, not to mention very electric (thanks in part to the solar wind). 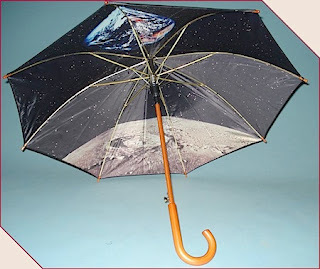 While scientists have suggested melting down nearby Moon soil in order to counter the rough dust particles, it may be better to construct large space umbrellas thanks to new research regarding lunar dust. "These are the first measurements of the collapse of the cohesive forces that make lunar dust so sticky" O'Brien says. If the Sun is really influencing the stickiness of lunar dust, then the easiest way to combat it may be to erect an enormous space umbrella over the Lunar base. While this may not give a future settlement an aesthetic look (which would not matter unless one was into the lunar hotel business), it could help reduce the amount of dust that makes it inside these future space habitats (a feature that may appeal to long term residents). Did Somebody Say Anti-Germ Space Paint? Aside from radiation, micro gravity and cabin fever, keeping a space ship clean can easily spell the difference between life and death. Since micro gravity has a way of encouraging the growth of deadly organisms, future explorers will probably have to spend a lot of time keeping their "space trailer" squeaky clean--especially the walls. While cleaning up the space ship may appeal to those in love with Mr. Clean, it may be better for space agencies to coat their space craft walls with anti-germ paint instead. (Fox News) Scientists at the University of South Dakota have invented a new germ-killing molecule that can be added to commercial brands of paint to give the paint long-lasting antimicrobial properties. In tests, Staphylococcus aureus organisms were killed with 10 minutes of contact, and E coli organisms were killed with 5 minutes of contact. Paint treated with Cl-TMPM was even effective against the superbug MRSA and other drug-resistant bacteria. Unfortunately the new paint is only effective against a small selection of organisms, although hopefully scientists will be able to expand it to a variety of organisms known to infest human habitats (whether on our homeworld, off world or even in space). If perfected, this paint would not only save future explorers countless hours in "de-germing" their extra terrestrial habitats, but make living on another world a lot safer as well. Despite pursuing a vigorous course to achieve lunarhood on Earth's nearest neighbor, it looks like NASA's plan for a Moon encounter may potentially be delayed by a few years. (Orlando Sentinel) NASA's internal plans had called for Ares V to go to the moon in 2018, though the agency had announced a public goal of 2020. Internal deadlines are used by NASA to keep programs on track and to provide a margin of error for developmental problems. But because of growing budget woes, the agency is resetting its internal date to 2020. And privately, engineers say that means the public 2020 date to send humans back to the moon is in deepening trouble. The news is the lastest sign of upheaval in the agency's Constellation Program which has been beset by financial and design trouble for the past few years. There is even talk now of cutting down the maximum number of crew that the Orion capsule can carry from six to four. It is the latest effort by NASA managers to reduce costs and the weight of the spacecraft. This news (if true) could not have come at a worse time for NASA as the agency is already having trouble securing a leader after Mike Griffin left. Hopefully NASA can get its game on by 2020, otherwise we may see future Lunar citizens speaking Chinese. Last week's Carnival of Space was hosted by Alice Enevoldsen upon Alice's AstroInfo which featured posts ranging from hot pink galaxies to our Sun's evil twin brother to even Steven Colbert making history by having a treadmill named after him. Bruce Irving of Music of the Spheres highlights the Mars 500 mission which will test whether humans can spend 17 months locked inside a tiny trailer--and live to tell the tale (without going insane). Ralph Buttigieg from The Discovery Enterprise argues a Venus before Mars approach, an idea that might anger a few individuals (note: I personally think visiting Ceres first would be wiser). Brian Wang from Next Big Future reports on (hopefully) promising steps by the private sector to bring about SPS (aka Solar Powered Satellites). David Portree of Robot Explores dusts off the NASA archives, exposing the agency's former plans at retrieving Martian soil. 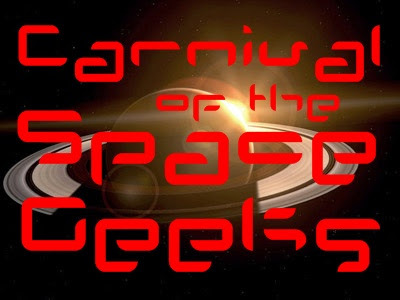 Be sure to read the rest of the entries, and for those of you interested in joining this weeks upcoming Carnival of Space, feel free to contact Universe Today for details on how to enter.